Polish jazz trumpet player and composer Tomasz Stanko, performing in Kielce, Poland in 2016. Stanko died Sunday at age 76. 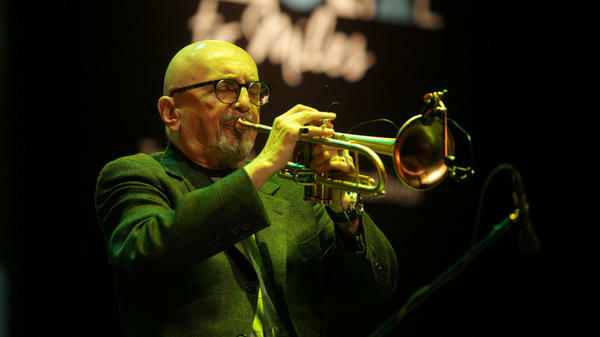 Polish trumpeter Tomasz Stanko, a leading figure in mid-1960s European avant-garde jazz who enjoyed a major career resurgence over the past 20 years, died on Sunday in Warsaw. His death was confirmed by his daughter, Anna Stanko, who said that her father had been diagnosed with terminal cancer in April of this year, and had been suffering with pneumonia since June. He was 76 years old. Stanko is best known for his soaring, elusively beautiful albums for the ECM label, most recently with a coterie of groundbreaking younger musicians he called his New York Quartet. Particularly through the New York Quartet, Stanko in his later years built strong bonds with young American players on the cutting edge of the music. Born on July 11, 1942 in Rzeszów, Poland, Stanko grew up under communist dictatorship. Like many behind the Iron Curtain, he first encountered jazz through Willis Conover's broadcasts for the Voice of America. He saw Dave Brubeck in 1958 on a State Department-sponsored tour, and as he recalled in a 2006 profile for The New York Times, "The message was freedom." And it proved irresistible. Stanko got his professional start in Krakow soon after. His trumpet playing, once praised by New York Times critic Ben Ratliff for its "soothing melodic shapes interrupted by flutters and harder intervallic stabs," had a sparse and often meditative quality not unlike his forebear Miles Davis. But his intensely concentrated lyricism owed as much to Don Cherry's work in the classic Ornette Coleman quartet, one of his chief early influences. Stanko's writing, spacious and enigmatic but also possessed of a deep and abiding sense of swing, had a catalyzing effect on experimentally-minded musicians such as pianist David Virelles and others, documented on the New York Quartet albums Wisława (2013) and December Avenue (2017). Stanko gained his first major exposure in the '60s alongside two Polish pianists, Adam Makowicz and Krzysztof Komeda. With Makowicz, he co-led an Ornette Coleman-inspired group called the Jazz Darings (and later the Stanko-Makowicz Unit); with Komeda's quintet, he took part in the 1966 classic Astigmatic, certainly rawer and more dissonant than Stanko's ECM output but not without aesthetic linkages and commonalities. Open-ended as it was, Komeda's music used melodic motives and formal structures to ground long improvisations, and this approach carried over into Stanko's later work as a leader. By 2002, Stanko was honing his late-career signature sound, with a Polish quartet featuring the exceptional pianist Marcin Wasilewski, on releases including Soul of Things, Suspended Night and Lontano. (Through Stanko, Wasilewski and Virelles both became ECM artists in their own right.) It speaks to Stanko's lasting impact that a piece from Suspended Night, "Suspended Night Variation VIII," was chosen as the very last track on Smithsonian Folkways' six-CD box from 2010, intended as a definitive jazz anthology from ragtime to the 21st century. Stanko went on to compose for film and theater as well. His notable sideman appearances include bassist Gary Peacock's Voice from the Past: Paradigm (1982) and a fierce 1985 offering from Cecil Taylor's Orchestra of Two Continents, Winged Serpent (Sliding Quadrants). He even made some deeply intriguing synthesizer-heavy fusion (Chameleon, Freedom in August, C.o.c.x., and Freelectronic in Montreux). In 2010, he published his autobiography, Desperado (in Polish). He is survived by his sister, Jaga Stanko Ekelund, and her family, as well as his ex-wife, Joanna Stanko, and their daughter Anna. One of Stanko's last major achievements was "Polin Suite," performed in October 2014 at the POLIN Museum of the History of Polish Jews. In this footage, Virelles is in captivating form, anchoring a new lineup with Ravi Coltrane on tenor saxophone, Dezron Douglas on bass and Kush Abadey on drums. Hearing the life force, the subtly attuned adventurism, of this multi-generational, multicultural quintet, with Stanko's horn burning calmly at its center, it's hard to deny what Stanko took to heart from the very beginning: The message is freedom.